At the insistence of the powers-that-be (a.k.a. Michelle), I must report that llamas have overrun the White Mountain National Forest in Western Maine, and are crowding out the whitetail deer. As this week's Bethel Citizen explains under the sub-heading "Just give me Jack Daniels whiskey and something to shoot," the U.S. Forest Service has authorized a hunting season for the animals. Most of the details of the hunt have now been worked out and are expected to be announced at Saturday’s press conference. But two key questions are still the focus of hot debate: How many permits will be issued? And how long will the hunt last? Local biologists had recommended that no more than 100 permits be granted and the hunt limited to the first week in November. But 100 permits were far too few to sate the feeding frenzy that ensued — soon the proposed number of permits for, and days in, the hunt were ballooning faster than the federal budget deficit. At this point, insiders’ best guesses are that on Saturday the Forest Service will announce a plan to issue 1,000 permits, for a hunt that will last from Halloween to the Saturday after Thanksgiving. And because the National Forest is regarded as a national resource, awarding of all permits will be handled from Washington. There will be no local allocation. If indeed this is the "call of the wild llama," even the most ardent PETA member should support the extermination of the species. 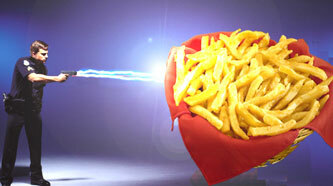 Chris D. reports over on All Things Maine that there was a potato-peeling fracas in Augusta on Sunday (March 26). Officers were called to the Eastern Avenue home at about 9 a.m. When they arrived, they said a man confronted them, wielding the deadly spud-skinner. Apparently realizing that he was no match for the police, the man dropped the peeler and ran into a nearby apartment. Police said he then came out, this time holding a knife. Tasers were used to subdue the fellow. Too bad he didn't have any potatoes on hand, they could have tried the tasers on them and gotten some fries out of the deal. Aaargh, So Strange.... Brain Hurts!!! This is part of a mural at a church in South Portland. It is the most disturbing Jesus I have ever seen. 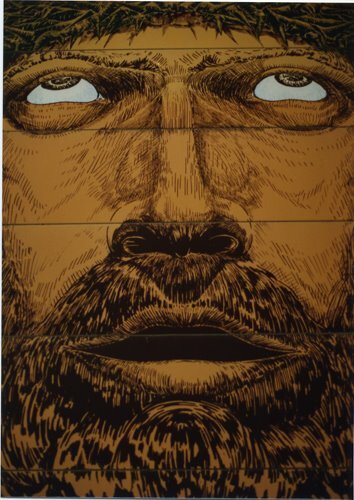 I'm afraid to comtemplate what the artist may have done next, as I suspect it was a fun house in which you walk into Jesus's dark, spooky open mouth. Please to view pretty boat, lovely lady. Spray painted anger on it's underside and a bicycle chained to it's ladder are the main attractions. It's hip, it's now, everyone wants one. And last, but certainly not least, a massive bull dwarfing the pickup truck that it sits in. If only every street had one, the world would be a much more joyous and confusing place. The Lewiston Sun Journal reported that a truck carrying chicken manure ran off Route 219 in Turner after it hit a particularly nasty frost heave last Wednesday (March 22), causing "something in the truck's front end to let go." Driven by Darren Gile of Livermore Falls, the truck made friendly with a utility pole, the wide free air 20 feet above the ground, and two trees before coming to rest on its driver's side. "I had a death grip on the steering wheel," he said. "All I could do was hang on and pray to God. I'm lucky I'm alive." As Gile so plainly put it, "That road is horrible. 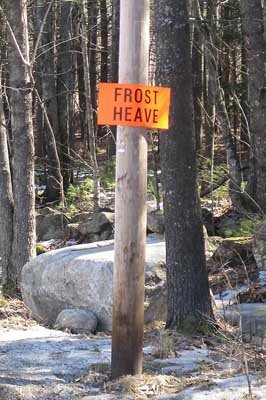 It's all frost heaves up through there." The Sun Journal is careful to report that Gile "later crawled back into the wrecked cab to retrieve his glasses," no doubt through the windshield he had escaped through earlier to crawl up the embankment and call for help. His truckload of manure had been thrown 100 feet wide of the truck in the crash, causing a DEP cleanup the following day to ensure no contamination of local wells and groundwater could occur. He was kind enough to go home and take a shower before going to the hospital for x-rays, which I'm sure made the staff very happy (this man has foresight!). His leg did not turn out to be broken. My roommate Salli was up in Union this past Sunday and took a fun drive on the backroads around Winthrop with the effect being something like a rollercoaster ride because of more frost heaves. Hang on to your hats! Photo by Michael Eric Bérubé of anothermaine.blogspot.com. Monday, March 13. Poland (Map 5) I thought my cat had tangled with a skunk. But the smell was not really strong. I found a dead critter in our drive. At first I first thought it was an albino squirrel. But upon closer inspection it seemed more like a ferret: all white except black tail, pink nose, black eyes. A friend told me to check out the web and I found you. My February 22 journal seems to match. Can you offer any photos or sites for info. 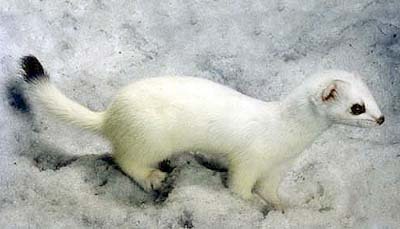 G.
In the same area of Maine, had a weasel in winter, Ermine, jump up on a log and look at me. Beautiful creature, black eyes and black tip on the tail, and pure white fur. Tuesday, January 21, 12:25 pm. Orono (Map 23) While cross-country skiing in the University of Maine's forest I observed an ermine cross the trail in front of me. Except for pictures I've never seen an ermine before but knew immediately that this small weasel with a white coat and black tipped tail was an ermine in its winter coloration. The coat was not pure white but more of an ivory color as it contrasted a bit with the snow. It was about 20 feet in front of me when it darted across the trail. On the opposite side of the trail it paused and stood up on its hind legs. At this point I noted it had something dark in its mouth that was about the size of a walnut. M.M.L. The ermine, otherwise known as the short-tailed weasel or stoat, is a special favorite of William T. Stands, who has an excellent account of them on his page, where he requests any sightings or stories about the critters be sent to him (address given on page). The ermine, according to the Maine Mammal Information Table, is small, with short brown fur (white in winter), and a black tipped tail year round. Its size averages about 7 to 13 inches long, it stands 2 to 3 inches tall, and it weighs from 1 to 6 ounces in weight. It is found lolloping around in brushland, open fields, and wetlands, where it hunts for mice mainly, but also shrews, baby rabbits and birds. Predominantly nocturnal, the ermine is also a tree climber, and investigates holes when hunting. 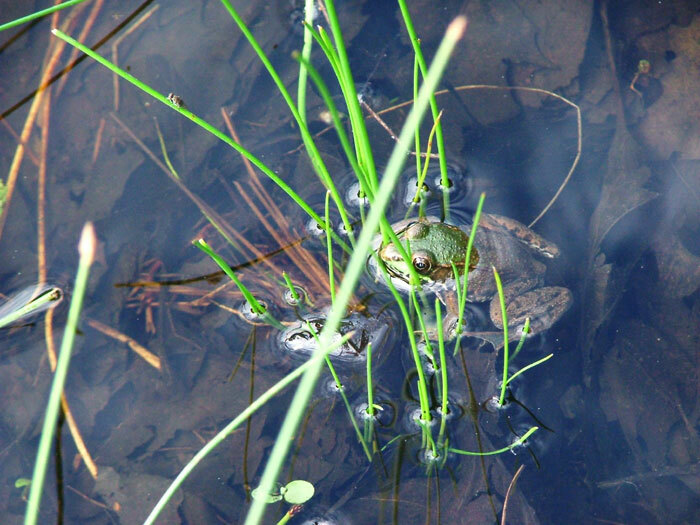 It births from 4 to 9 babies in its litter sometime between May and June each year. And it is very cute. A rare opinionated piece from your editor. Be forewarned!!! According to the Portland Forecaster's March 15, 2006 issue, some Danforth Street residents are making noise about rowdy train couplings at the Merrill Marine Terminal. However, out of 250 interested parties that were mailed notices of a meeting to discuss the alleged problem, only two people showed up (though a few wrote letters to the city). The Forecaster quotes Mary Elizabeth Duggan as saying "The coupling sounds like it is happening right under our condos." "We are moving the commerce of the state of Maine," says David Fink, Jr., Guilford Rail Vice President. And he has a good point. Just because you bought an expensive condo to purchase a piece of Maine's seaside peace and quiet near a nice urban center here in Portland doesn't mean the world is going to stop around you. Perhaps someone forgot to tell folks that here in Portland we have a working waterfront. Something has to happen to allow goods and supplies to move from place to place so folks can have all their conveniences. We can't pack the machinery with cotton balls. It makes much more sense for the few people the noise is bothering to have a pair of earplugs handy. According to the article, Guilford switches 25 to 100 cars nightly at the terminal. The rate and timing of the rail traffic is dependent on a wide range of factors, including the fact that "movement on the rail lines in Maine is affected by what happens at terminals throughout New England." We need to look at the larger picture here, folks. I lived next to a railroad track once, not more than ten or twenty feet away, and quickly became used to the noise. It even went so far as to please me, because it reminded me of my connection to the greater world. Perhaps people should enjoy where they live a little more. The influx of high-priced condos into the downtown Portland area is starting to sound a note of doom to many of us that live here on marginal (and all too normal) incomes. The idea of Portland becoming packaged and sanitized is a dire harbinger of a process that will, now that it has started, no doubt spread throughout the entirety of this unique state, and threaten its very soul. 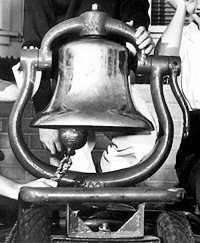 Ask not for whom the bell tolls -- it tolls for thee. According to Haunted New England by Mary Bonte, back in 1801 Pond Island, Maine, was host to an early grifter, "The Professor" by name, who convinced local Harpswell men that he was perfectly able to turn dew into silver. Dew was collected and taken out to Pond Island where it was put in a kettle and set on an outdoor fire. The pot boiled, the steam rose, and the silver failed to materialize. 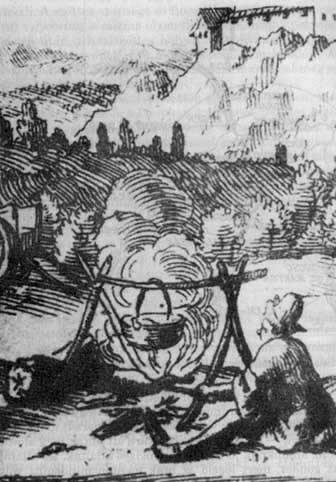 Claiming that the dew had been subject to deleterious handling, "The Professor" conducted a second experiment, this time surreptitiously slipping a handful of melted-down silver into the boiling pot. Finding the silver in the bottom of the kettle, the citizens were convinced that dew could indeed be turned to silver and they gladly paid a handsome fee to "The Professor," who promptly vanished very much like morning dew. Harpswell isn't the only Maine town to fall for swindlers' stories. A goodly number of Portland businessmen in the 1800s lost substantial funds to another huxter in a gold hoax. More on this later. I just blogged at All Things Maine about the latest project of director Gunnar Hansen—a short film about the Passamaquoddy tribe. 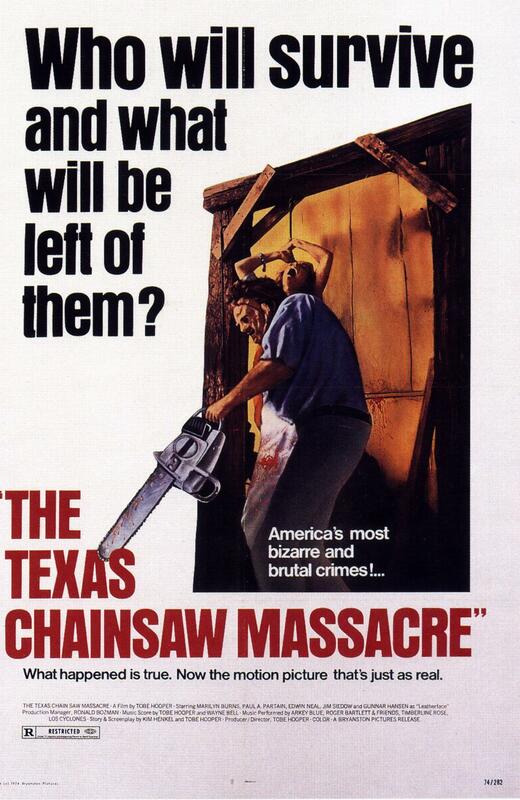 You might remember Hansen from his first film role: Leatherface in The Texas Chainsaw Massacre. 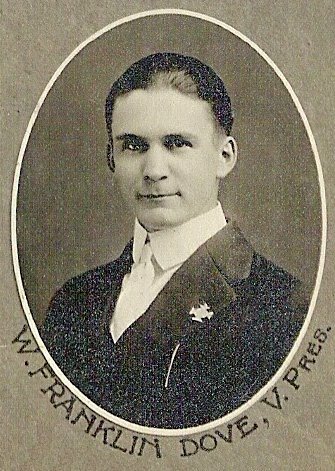 Hansen was born in Iceland, but lived in Searsport for five years as a boy, moving with his family to Texas at age 11. He returned to live in Northeast Harbor in 1975, a year after Massacre's release. In a 2004 AP story, he talked about how the kids at the local elementary school occasionally approach him with trepidation. Hansen said he never learned to use a chainsaw with confidence, even after moving back to Maine. He revels in the notoriety of his first screen role, and takes time away from his writing to appear at horror conventions. Best of all, he has a rear license plate holder that reads, "What Would Leatherface Do?" 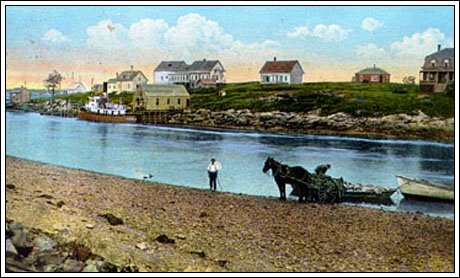 Biddeford Pool, Maine, was a miracle pond once a year, for whoso bathed there on the 26th of June would be restored to health if he were ill, because that day was the joint festival of Saints Anthelm and Maxentius. Of course, like many of Skinner's folkloric asides, there is little online to back up this tale, beyond accounts of the saints whose names are attached to the date mentioned. Anthelm and Maxentius are not alone -- there are at least 16 saints, all told, who are remembered on that date. Not generally famous for its scientific masterminds, Maine occasionally surprises the rest of the world with inventions and improvements seemingly from out of the blue (it's our little secret -- there are a lot of smartypants living here). Back in May of 1936, Dr. W. Franklin Dove, a biologist at the University of Maine, published a journal article titled "Artificial Production of the Fabulous Unicorn" in the Scientific Monthly (Vol. 42, pgs 431-436). This article detailed his experiments in forming an artificially created unicorn. To accomplish this, he performed surgery on a day-old Ayrshire bull-calf, in which the calf's hornbuds were removed and reinserted in a single position at the center of the calf's forehead. 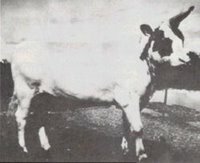 The same Skeptic article mentions the possibility that this was the same technique used by African Dinkas and Karrirs on their cattle, and by the Nepalese, presumably to mark the leaders of their herds. Dr Dove's Unicorn bull became the leader of its herd and was very rarely challenged by other males. Which is not altogether surprising if you think about it. When bulls charge each other the main aim (as with male deer) is to crack skulls until one or other can take no more. Charging towards an enemy who has a spike aimed right between your eyes is a different game altogether. So effective was the single horn that one almost wonders why evolution did not do Dr Dove's work for him. An interesting side effect of the experiment was the nature of the bull's temperament. Being secure in his strength led him to become unusually gentle and mild mannered, echoing what has so often been said of the true Unicorn's nature. Who knew the unicorn and science could co-exist so peacefully, and in Maine of all places? For more on the Church, please click here. Pretty interesting stuff. The Church is gathered as a neo-pagan earth religion, taking inspiration from Heinlen's sci-fi classic, Stranger in a Strange Land. The Church's official site is located here. Quit your snickering over there, you! 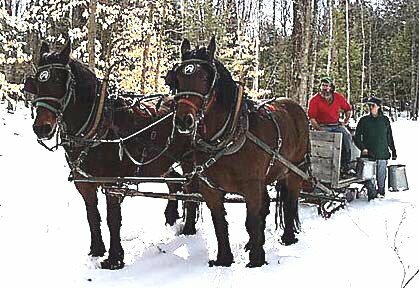 Just a reminder to any fellow maple maniacs out there -- SUNDAY, MARCH 26th is Maine Maple Syrup Sunday!!! So empty your trunk, load your friends and/or family into the car, and visit one of Maine's many maple farms for demonstrations of maple syrup making, taste tests, and all sorts of other maple syrup shenanigans. Sysladobosis (sic) Lake, in Maine, has a snake with a head like a dog's, but it is hardly worth mentioning because it is only eight feet long -- hardly longer than the name of the lake. More enterprise is shown across the border, for Skiff Lake, New Brunswick, has a similar snake thirty feet long. Trails.com summarizes the neighborhood thusly, with no mention of monsters: "The loop comprised of Pocumcus, Junior, and Sysladobsis lakes in the heart of eastern Maine’s lake country offers one of the best extended quiet-water loop trips in the state, especially when one detours for a few days into Scraggly Lake. These lakes flow into the St. Croix River, which forms the southeastern border between Maine and New Brunswick. Because you can end up where you started, the trip requires just one car. But be aware that these are large lakes; under breezy conditions, large waves can build up quickly, making paddling difficult and, at times, quite dangerous." The lake (consisting of an Upper and Lower lake) straddles the Washington and Penobscot counties. Personally, I find the name "Scraggly Lake" very alluring in a Charlie Brown Christmas Tree kind of way. Portland police say that Nicholas Foley, 27, became sick at the Cumberland County Jail on March 12th and threw up 31 bags of heroin. Police also found nine bags of heroin hidden in Foley's cigarette pack. Foley was in the process of being relased from the jail after being involved in a dispute with another man over money. He was taken to the Maine Medical Center. I have different plans for getting myself into The West End News. More likely to involve skeletons and tombstones than heroin and barfing, thank you very much. Meanwhile, you all should really be using their website for some comments and discourse on what goes on around here! Really. Quit poking around on eBay for once and interact with some real human beings. I found a remarkable little site online the other day when I was wandering around. Holy Places in Portland, Maine, lists a variety of sites around the city that Maine pagan Sarah Kate Istra Winter, also known as Oenochoe, has found in her travels. She is the author of the recent book KHARIS: Hellenic Polytheism Explored. Sites she mentions range from the geographical (Western Cemetery, Deering Oaks) to the mundane objects we walk past every day, such as the lobsterman statue at the corner of Temple and Middle Street, or the old theater mask of Bacchus that sits quietly on the grass island in front of Bagelworks and Smoothie King on Temple Street. It's funny, in all my years in Portland I never thought of this stuff in this way, but it's an interesting approach. Somehow I missed the fact that "not only can the Lobsterman be viewed as the spirit of Casco Bay as well as the guardian of our fishing industry, but his inherent numinous power seems to have been recognized independently by a variety of young people in Portland, as there is a widespread custom of leaving spare change as an offering in his cupped hand and making a wish." I never knew. 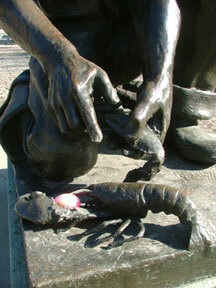 Although I did leave him and the lobster an easter egg last year... I hope they liked it. Coming back on Vaughan St. towards intown, take a right down Congress St. A few blocks down you'll come to the Fire Station, and right in front there is a plaque commemorating a hanging. Hanging sites are sacred to the Norse god Odin, who was hung on a tree for nine days and nights to learn the secrets of the runes. She is nice enough to provide a walking tour of the sites, with clear directions to each location. A really neat Portland resource for someone to have volunteered. Who knew that the University of Maine had its own Skulls society? The Maine Senior Skulls were founded almost a hundred years ago, on December 14, 1906. Do they have any relationship to the now infamous Yale secret society of Skull and Bones, founded long before in 1832? If they do, they haven't mentioned it in their brief history given on their website. According to the website, with its membership culled from the select top 1 percent of UMaine seniors, the purpose of the Skulls is "to recognize dedicated service to The University of Maine, to promote campus spirit, to keep an eye on the fraternities, and to discipline freshmen." Poor freshman! In fact, "in 1911, the Senior Skulls created the Sophomore Owls, whose purpose became the discipline of freshmen." They were apparently very dedicated in this pursuit. A slightly different capsule history of the group is given here. In Curtis D. MacDougall's 1940 book, Hoaxes, one of the early chapters is called "Why We Don't Disbelieve." 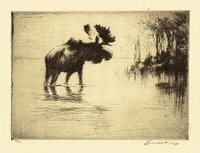 In that chapter, brief mention is made, under the heading of "recent additions to unnatural history, all of which received space on press association wires", of "a 'specter moose' reported to have appeared again in the woods of Maine after having previously been seen in 1901, 1917, and 1932." Illustration: Bull Moose etching by Levon West, 1927. 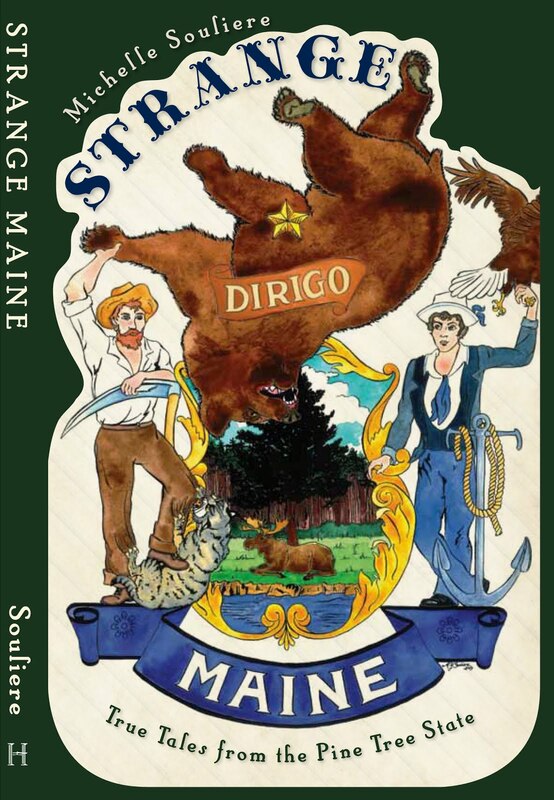 Well, it was bound to happen sooner or later, and this seems an eminently fabulous note on which to start so... welcome to Strange Maine Fiction! From time to time we will present a piece of fiction that embodies some of the spirit of Strange Maine, and which is of a quality and type we think you will enjoy. Our inaugural piece is by the Portland Banner's own Bob Bergeron, and is titled The Haunted Marsh. 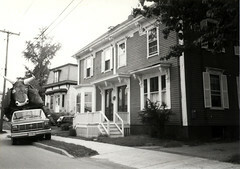 Set in the familiar Back Bay of Portland, Maine. This is the kind of stuff that legends are made of. Click here to download a PDF of The Haunted Marsh. NOTE: If you don't have Adobe Reader on your computer, please click here to download the software for free. In an article by Paul Bisulca, a Penobscot Tribe myth of the origins of the Penobscot River is discussed. The people needed water, and it had mysteriously ceased to flow from a local stream. A person was chosen to follow the dry stream bed and find out what had happened. Coming to a great mountain in the streambed, he made camp for the night. With a great shake of the earth he was awakened the next morning, to find that the mountain was actually a giant greedy frog that was intent on keeping all the water for himself. The man sensibly returned to the village to confer with the elders, knowing full well there was little he could do by himself against such a mammoth foe. The elders called upon the services of Klose-kur-beh (also known as Kluskap, I believe), "the first man on this land," and he agreed to help, seeing the suffering of the people without the stream's water to live on. He turned himself into a giant, and improvised a weapon by pulling a great pine tree out of the ground. "Raising the tree in the air he slammed it down on the frog, which burst and spewed water in a thousand directions. As the water fell to the earth, it drained into the depression created by the uprooted pine tree and flowed powerfully from there. That is how the River came to be." So the next time you go swimming in the Penobscot, remember you are swimming in giant frog juice. The MORAL: Just because you are big and greedy and want everything for yourself, and are big enough to take it and not share, doesn't mean someone won't come along and pop you in the head with a tree to make something better out of you. If only a few corporations could learn that lesson the hard way, things might get a little bit better around here!!! "...a second guest was brought in to ice the cake and fulfill their metal fantasies. Jason called his friend, Frank Aresti who had just returned from touring Europe with Fates Warning, & asked if he would contribute his one of a kind flare to their original song, "The Ghost Of Xavior Holmes." Once Frank got a hold of the track and delved into its murky themes of a haunted New England ship wreck, he was hooked & went above & beyond playing a solo to actually contribute several ideas to what has become one of the album's highlights." The song itself is an enjoyable listen for nautical heavy metal fans (har har), and an appreciable embracing of ghosts, Maine, and shipwrecks for the rest of you. I'm so alone, trying to stay alive"
"I'm so alone, eternally sailing into the night"
Why is he the only one left, drifting forever on? "What should have been a routine trip has cost the lives of sixteen"
The Inn By the Sea is in Cape Elizabeth, not Portland, though I can't imagine that (if it was in existence already in 1807) it was called "The Inn By the Sea" back then. Their website doesn't seem to have any information about the inn's history. Searching "Xavier Holmes" online doesn't seem to bring up anything either, so that name may even be a fabrication. Not a big deal, just hard to research history without a real name to go on. So much for the song. Research of the historical event related in the song was a little more fruitful. On the road leading from Standish Corner to the lake is the home of the poet Shaw, built in 1774, where the first settlement was made by Ebenezer Shaw. The ballads of Thomas Shaw, the son, were well-known along the coast of Maine for many years, and date back to the Revolutionary war. Conspicuous among his productions was the "Shipwreck of the Schooner Charles," on Richmond's Island, July 12, 1807. The ballad was headed by sixteen black coffins, to represent the number of victims, and surrounded with a heavy border. It's well-known what attention getters coffin silhouettes are. It's a good thing there weren't dozens of deaths, eh? The printer would have run out of room. His verse was indeed "unlernt," lamentably bad, worthless today, except that it indicates the isolation of mind and poverty of vision that was inevitable in those days of material and political struggle. Yet the "mournful songs" of Thomas Shaw supplied a demand of the time. Thousands of these "broadsides" were sold in Portland and in the numerous villages of Cumberland County. One song, at least, went into a second edition, and the "poet" must have found his writing profitable, selling thousands of his "Broadside Ballads" at six and a quarter cents a piece. "1819 March 17. Mournful Song, On a man and wife, who froze to death in one night, on Standish Cape, so called. This sheet has two black coffins printed at the top, but does not contain the author's name. It commemorates the death of Mr. Samuel Tarbox and wife who froze to death in the great storm of 1819." "1808 August. On the Hanging of Drew. Shaw and his son went to Portland to see Drew hanged, and he records, in his journal, 'Aug. 27. While. I was at Portland I got a piece printed on Drew.'" There is other ephemera on the Richmond's Island incident, as enterprising publishers no doubt smelled profits from miles away. Even today you can find items listed on Amazon that are relics of the event, such as An elegy on the distressing scene of the schooner Charles,: That was wrecked on Richmond's Island, near the entrance of Portland harbor, the twelfth day ... twenty two persons, sixteen of whom perished (The Saints) (Unknown Binding) S. Low, Son & Co (January 1, 1807). Another man-on-the-street sighting (or is it mutant-on-the-street this time?) by the folks at the West End News in the Dumpster section of the March 3-17 print issue. This time they've spotted a guy walking down Congress Street wearing a gas mask. Last time it was a guy in a straitjacket. Portland needs more of this. 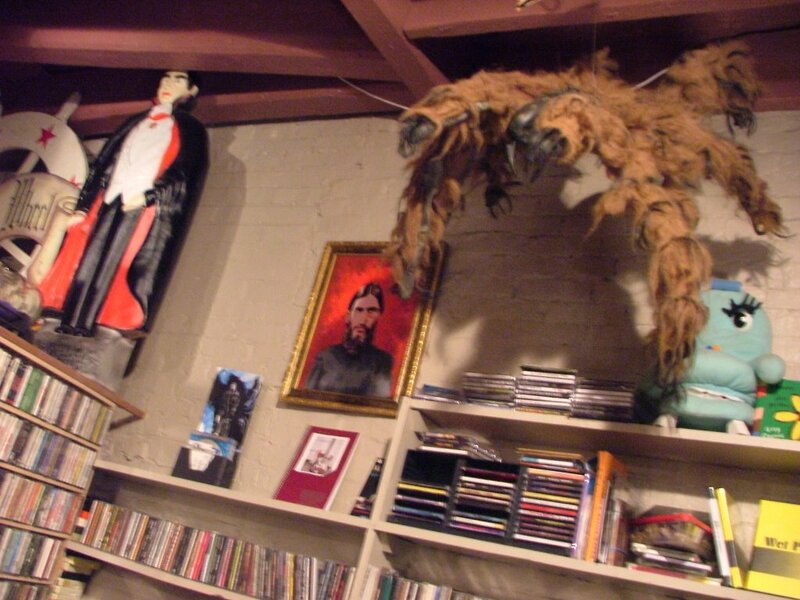 I myself have very fond memories of walking home to our old Brackett Street apartment with Tristan from Brendan Evan's shop, Strange Maine. I remember, it was a bright sunny summer day, or maybe it was early fall. At any rate, it was nice out, and we strolled along, Tristan with a mannequin torso under his arm, and... well, let's just say there was a very amused tourist couple somewhere back in Japan showing their friends a photo of this wonderfully strange sight. These things only really work when they are unplanned. We had been visiting with Brendan, and he offered us his somewhat the worse for wear mannequin torso (she is missing part of her nose and in general has a haphazard skintone). Apparently she was freaking his girlfriend out (as opposed to the giant furry spider that forms another staple of the store's customary decor, shown here). So we adopted her and gave her a new home. But we were on foot, so what other way to get her home than carry her, naked and worn? Yep. For many months she peeked out of the front window of our first floor apartment in front of the Reiche playground. Brendan's girlfriend wasn't the only one she freaked out. When the Time Warner guys came in to install our cable, after seeing her in the window, three of them came in, just in case. I guess we all missed the Feb. 17 story in The Bowdoin Orient about strange circles appearing on the college's quad. The large design consisted of three multi-colored concentric circles. The phenomena melted before an in-depth study could be undertaken. I especially like the part that says "alumni were able to monitor the situation remotely by accessing the Quad webcam on Bowdoin's web site." Was anyone monitoring the webcam when the circles were made? Has evidence been destroyed? Ezra Stephens, a storekeeper in Bryant Pond in the mid-1800s, managed to procure a trained bear and start his own circus in Western Maine. An unfortunately truncated 1953 article from Bandwagon describes his efforts to make himself "The Barnum of Maine," and credits him with originating the "bannerline" and the sideshow. Stephens proved himself a first-class showman in presenting this bear to the public, so he decided that the amusement world was his forte and commenced adding to his attractions. What to offer the public was never a problem with him, as he emulated the efforts of P. T. Barnum, and in the early years the attractions Barnum was exhibiting in his American Museum would find a counterpart in the Stephens' show. The article describing his death was not attached, so I can't say how Stephens managed to mistakenly drink wood alcohol. 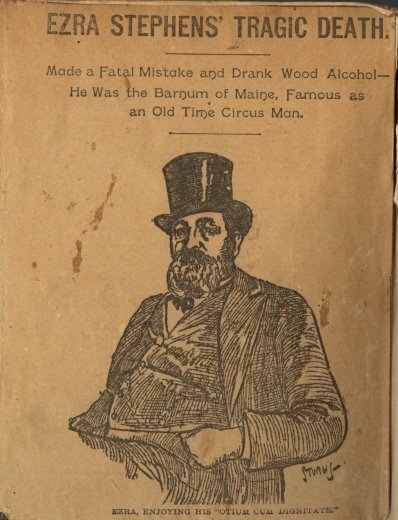 If he really was "The Barnum of Maine," I wonder if he charged admission. Chris W and I went out to take photos in the freezing windy-ness (doesn't she look cold?) of Saturday February 19th. Brrr!!! 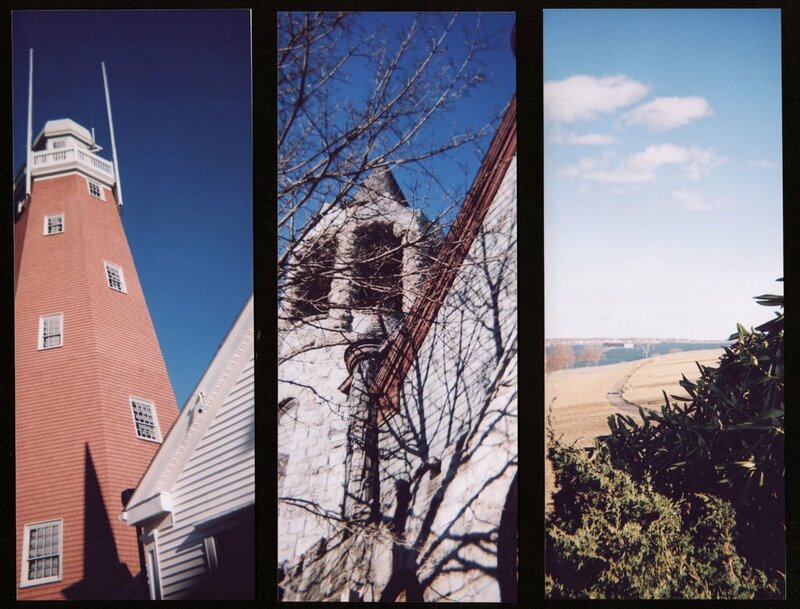 We were trying out our new cameras, a couple of identical, plastic crappy Vivitar panoramic models. We love bad cameras. You never know what they are going to do. We wandered all over downtown Portland and wound up on the Portland Trails segment that runs alongside the narrow gauge railroad that you can access where India and Commercial Street meet. It was good. Here are some of the fruits of my labor. Hopefully Chris will get a chance to post hers soon too. Shown here are from left to right: the Portland Observatory on Munjoy Hill, a turret of the St. Lawrence Church also on the Munjoy Hill, and view of the bay from the Eastern Promenade. Up at the top of this post, over Chris' head, is one of the old brick buildings off of the trail around the Eastern Prom. From Ernest Dodge's excellent memoir Morning Was Starlight: My Maine Boyhood, comes this tidy little tale of man and cat. Dodge grew up near Ellsworth in the early 1900s, on the Bayside Road along Union River Bay, witnessing the dramatic changes in lifestyle that occurred in the first few decades of the 20th century as the world changed, and so did Maine. "My one experience with a bobcat was explosive. My family was taking one of our Sunday walks through the woods and I was running on ahead, boy-fashion, when I saw what looked like a nice soft pile of brush to jump into. Running down the wood road, I took a flying leap and pitched feet first into the middle of it. No sooner did my feet touch the brush than from beneath there came a wild sound like a screech from the damned and a gray streak burst out of the brush pile and disappeared into the woods. I had landed on top of a sleeping cat and startled him as much as he frightened me." "One winter during the early twenties, speculation ran rife over the sighting of extremely large cat tracks by most of the local men. Apparently some varmint of unusual and spectacular size was roaming the forest. There was talk of Canada Lynx and of panthers. * This last was not taken seriously at the time for the panther was never common in New England. The beast was never seen, but since then panthers have been said, on good authority, to roam even farther east in some of the wilder regions of New Brunswick." *: panther meaning mountain lion, I believe. For those interested in Maine life, I highly recommend this book (available at the Portland Public Library's Burbank Branch on the shelf at 974.1/D644-P, or through interlibrary loan). It's quite well written, very straightforward, and in its arrangement of recollections by season it really suits the feel of Maine admirably.